Cleveland Clinic’s Gamma Knife® treatment combines state-of-the-art radiosurgery treatment technology with medical expertise to provide treatment solutions for the most complex brain tumor diagnoses. Gamma Knife® surgery is a safe, effective treatment that offers lower risk than conventional brain surgery. In the case of many of our Gamma Knife patients who have good systemic control of their disease, radiosurgery has its greatest impact on improving survival and on maintaining the ability to carry on a normal life,” said Dr. Vogelbaum. Cleveland Clinic offers its state-of-the-art Gamma Knife Center, providing innovative brain tumor surgery alternatives to conventional, invasive brain surgery. Over the course of their illness, nearly 25% of cancer patients will develop a metastatic brain tumor. Patients who have developed tumors deep in the brain often cannot have these tumors removed safely by traditional brain surgery. Gamma Knife radiosurgery gives these patients comparable results to surgery, with the advantage of a minimally invasive procedure, requiring no incision. 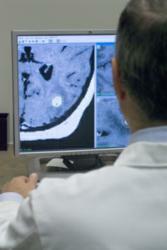 Gamma Knife surgery delivers targeted radiation to the specific tumor location(s) in the brain. It is a safe, effective treatment that offers lower risk than conventional brain surgery and with low complication rate. Performed on an outpatient basis and rarely requiring an overnight stay, Gamma Knife surgery can also be a prescribed course of treatment in conjunction with other therapies such as chemotherapy, radiation or surgery. As one of the busiest and most experienced Gamma Knife centers in the country, having treated nearly 4,000 patients since opening in 1997, Cleveland Clinic Gamma Knife Center® is also one of a select group of medical centers that trains other physicians on this type of radiotherapy treatment. The neurosurgeons, radiation oncologists and medical physicists at Cleveland Clinic offer a level of expertise that can dramatically affect patients’ outcomes: “It's not just the Gamma Knife itself; it's the physician using it that matters,” said Michael Vogelbaum, MD, PhD, Associate Director of Cleveland Clinic’s Rose Ella Burkhardt Brain Tumor and Neuro-Oncology Center. “At the Burkhardt Brain Tumor Center we believe that access to multiple tools, along with the knowledge and experience to understand how best to use them to treat each individual patient, can make a difference in the length and quality of survival,” Dr. Vogelbaum said. “In the case of many of our Gamma Knife patients who have good systemic control of their disease, radiosurgery has its greatest impact on improving survival and on maintaining the ability to carry on a normal life,” said Dr. Vogelbaum. Patients who undergo the Gamma Knife procedure experience little or no post-treatment discomfort or pain. They enjoy a rapid return to normal activities, without the need for physical therapy or other rehabilitation. Gamma Knife surgery is typically covered by most insurance companies and Medicare. Cleveland Clinic is a nonprofit multispecialty academic medical center that integrates clinical and hospital care with research and education. It was founded in 1921 by four renowned physicians with a vision of providing outstanding patient care based upon the principles of cooperation, compassion and innovation. Cleveland Clinic has pioneered many medical breakthroughs, including coronary artery bypass surgery and the first face transplant in the United States. U.S.News & World Report consistently names Cleveland Clinic as one of the nation’s best hospitals in its annual “America’s Best Hospitals” survey. About 2,800 full-time salaried physicians and researchers and 11,000 nurses represent 120 medical specialties and subspecialties. Cleveland Clinic health system includes a main campus near downtown Cleveland, eight community hospitals and 18 Family Health Centers in Northeast Ohio, as well as Cleveland Clinic Florida, the Lou Ruvo Center for Brain Health in Las Vegas, Cleveland Clinic Canada, and, opening in 2013, Cleveland Clinic Abu Dhabi. In 2011, there were 4.6 million visits throughout the Cleveland Clinic health system and 160,000 hospital admissions. Patients came for treatment from every state and from more than 100 countries. Visit us at http://www.clevelandclinic.org. Follow us at twitter.com/ClevelandClinic. The information contained in this communication was developed by Cleveland Clinic's Marketing Department.